'I would hope the American people are smart enough to smell the foul odor that's coming out of the United States Senate.... Those people in the Senate who are basically looking out for the interests of somebody else other than the American people will have to pay the political price and I'm sure Senator McCain, when he runs for president, will find that out." So spoke Representative Dana Rohrabacher in response to a recent bipartisan Senate effort to pass an immigration bill less harsh than the draconian one he, and most of his House Republican colleagues, favored. (This was before Rohrabacher went on to urge that we use prisoners rather than immigrants to harvest California's crops.) In just a few words, Rohrabacher touched on every one of American nativism's elements: the fawning populism, the threats of blackmail and reprisal, the unusually ugly language. Immigration debates are like that. No other issue (except, of course, race) brings out so prominently the demagogues among us. If you find this an exaggeration, watch any television program featuring Lou Dobbs. Interestingly enough, the bill that Rohrabacher opposed--named after its unlikely co-sponsors Senators John McCain and Edward Kennedy—would easily have fallen into the category of restrictive legislation if it had been launched into a different political environment. After all, this more liberal bill called for increased spending on border enforcement, limited future visas to 400,000 per year, established procedures designed to encourage immigrants to return to their countries of origin, and increased fines for the hiring of illegal immigrants. But McCain-Kennedy did allow illegal immigrants currently in the United States to begin a laborious journey toward green-card status, and this was enough for its opponents to cry "amnesty," which is anathema to House Republicans. Still, the ideas that inspired McCain-Kennedy may not be dead. With massive and moving demonstrations throughout the country, immigrants have won increased public sympathy; and in the face of the voting power that they may begin to exercise, hard-line stances such as those adopted by House Republicans could backfire politically. But even if immigration reform does happen, many concessions will have to be made to nativist sentiment as the price for giving illegals a fair chance to become legal. There is little doubt that the American mood toward immigration these days is more restrictive than it is welcoming. It is not just the rhetoric surrounding it that makes immigration different from all other political issues. On some issues that have captured public attention—Terri Schiavo, stem cells—the public is more moderate than the ideology-driven zealotry of America's leaders. But not immigration. On this issue, traces of bipartisan compromise can be found in Washington, while a deep polarization exists outside the Beltway. Like abortion, immigration raises profound moral questions about our obligations to the weak and the vulnerable; but unlike abortion, it also carries with it economic consequences that directly involve business and labor. As with any foreign policy issue, immigration touches on our relations with allies and enemies; but it is discussed almost exclusively in terms of its effects at home, irrespective of its consequences abroad. The Bush tax cuts divided people along ideological lines, but in contrast to tax cuts, the lines with respect to immigration are so imprecise that conservatives and liberals find themselves on one side fighting furiously against conservatives and liberals on the other side. Compared with Social Security reform or the war in Iraq, immigration affects fewer Americans in any direct way (and does not result in significant loss of life for those it does affect), but unlike those issues, it breaks once solid political parties into warring factions and is capable of shifting the balance of power from one party to the other. Immigration, in sum, stands alone among the questions urgently facing American society, with its own coalitions, ideological appeals, voting patterns, and history. No wonder, then, that the debate over immigration is anything but straightforward. Nothing in either the House or Senate bills says anything about religion, but the Catholic Church is deeply engaged in the issue, evangelical Protestants are split over it, and Jews carry historical memories that flood their minds every time the subject comes up. Immigration is frequently viewed as a civil rights issue—the reforms of 1965 were passed in the wake of the Civil Rights Act of the previous year—but African Americans have never been strong supporters of expanded immigration. Those who talk about states' rights will become strong advocates of national authority if state governments, responsive to agricultural and business interests, look the other way when illegal immigrants attend public schools, receive welfare, and apply for drivers' licenses. Liberals and Democrats will wax enthusiastically about America's commitment to Latinos while gutting immigration reform to reduce their political vulnerability. Throughout American history, immigration has been opposed by eugenicists and population-control enthusiasts, and analogous (and obviously less odious) concerns about the environment have replaced them, leading such organizations as the Sierra Club to be either hostile to or divided over immigration reform. Recent immigrants themselves cannot always be counted on to support greater immigration, even of their own ethnic and racial groups. And, as Peter Beinart has pointed out in these pages, conservatives who trumpet the power of the market and denigrate government routinely call on government to prevent the market from functioning when the commodity in question is immigrant labor rather than bananas or softwood lumber. When it comes to immigration, the only surprise is surprise itself. There is little in the biography of any particular politician—not party, not ideology, not geography, not even family history—that can readily predict his or her stance on controlling America's borders. (Besides Rohrabacher, the other major opponent of immigration in Congress is a man named Tancredo.) On this issue, the talking points have not yet been written and the focus groups have not yet focused. Immigration policy is for people who love their politics raw and unscripted. It is as if debates over immigration constitute a vast thought-experiment, repeated test cases designed to tell Americans who they are and, more importantly, who they want to be. If you want to understand why the politics of immigration take the form they do, read Aristide R. Zolberg's richly informative book immediately. Zolberg, a political scientist formerly known for his work on Africa and Europe, has become increasingly fascinated by what scholars in his field call "American political development." Fashioned as an attempt to restore to political science a concern with the real world that rational choice theory left behind (although lately there are efforts to bring these approaches together), American political development favors history over economics as the first cousin of political science. Political scientists inspired by this approach want to know how the American state formed itself, developed its authority, adopted particular policies in the face of domestic and international transformations, responded to and in turn influenced legal regimes, and spawned constellations of parties and interest groups. The field of American political development promises answers to questions such as these: is America exceptional, and if so, how? What policy options today were foreclosed by policy decisions taken in previous times? Are practices and procedures we tend to consider as well-established—a competitive two-party system, federalism, separation of powers—really contingent and therefore amenable to future changes? An interest in American political development causes many a political scientist to spend unusual amounts of time in archives—not just to tell a story, but also to ponder why organized labor is weaker in the United States than in other comparable countries, how wars have shaped the distribution of political authority, which groups obtain and use suffrage and which do not, and why the American administrative bureaucracy lacks effective coordination. American political development has produced a number of major works, including Richard Bensel's The Political Economy of American Industrialization, 1877-1900, Rogers M. Smith's Civic Ideals: Conflicting Visions of Citizenship in U.S. History, Stephen Skowronek's Building a New American State: The Expansion of National Administrative Capacities, and Sidney M. Milkis's The President and the Parties: The Transformation of the American Party System Since the New Deal. These are important and valuable books--but it has to be said that, in all, American political development has not yet delivered on many of its promises. Nobody has quite resolved whether the United States really is exceptional; European welfare states are being cut back in ways similar to American retrenchment and the question of why there is no socialism in the United States has been replaced by the question of why there is no socialism anywhere. The notion of "path dependency" enthralls nearly all students of American political development, but pointing out how certain options were foreclosed when others were chosen is not much of a theoretical insight. History does help to explain why the American state has the special properties that it does, but it cannot help much in explaining why Republicans are now in power rather than Democrats—or why Republicans, despite their anti-statist ideology, inevitably expand government's size and reach. One reason for the mixed success of American political development is that, in their efforts to explain the American nation-state, political scientists have paid a great deal of attention to the state and relatively little to the nation. Policies, parties, procedures: they all influence and are influenced by government. But government exists within a nation whose identity, at least in this country, is as contingent as the policies that government adopts. Americans did not create a nation by inheriting a conception of who they were from some mystic past and then asking new arrivals to adopt to it. Instead, we barely began as a nation at all. Although the United States declared its independence from Great Britain in 1776 and adopted the Constitution in 1787, it did not become a nation until the ratification of the Thirteenth, Fourteenth, and Fifteenth Amendments in the wake of the Civil War. (Before the Civil War, leaders spoke about the Union, not the nation.) And even when America finally did become a nation, waves of immigrants—large numbers of whom were neither Protestant nor English-speaking—raised complicated questions about what kind of nation it was going to be. Americans love to debate their identity precisely because their identity is sufficiently flexible to be debatable. And so immigration deserves the passion, the polarization, and sometimes even the excessive rhetoric associated with it. True, such debates fuel a politics of symbolism ripe with opportunities for demagoguery. But symbolic politics are not some epiphenomenon that fills in the gap when "real" issues such as Medicare or energy policy lose their saliency. People may not consume symbols, but they are often willing to die for them. Nations, moreover, not only have symbols, they also are symbols. When people say they are proud to be Americans—or these days when, exasperated by George W. Bush, they say the opposite—they are not talking about how much money they make or whether the trains run on time. (In this country, they are especially not talking about how the trains run on time.) People take pride in, or express shame over, what their country stands for. If it symbolizes freedom and democracy, they beam. If it is seen to represent imperial overreach, they blanch. Enter the terrain of symbols, the traditional preserve of anthropologists and sociologists rather than political scientists, and before long the question of culture will arise. Most nations define themselves through their culture: the language they speak, the literature and music they produce, the history they share, the monuments they treasure. Yet while there clearly is such a thing as American culture, this country, because it refashions its identify so frequently, does not attach its identity to its culture to the extent that most other nations do. Samuel P. Huntington thinks otherwise, of course; in Who Are We?, his recent book lamenting America's relatively liberal immigration policies, he argued that a culture shaped by dissenting Protestants in the seventeenth and eighteenth centuries is in danger from arrivals from Mexico. But Aristide Zolberg will have none of that. Although his method is scholarly and his tone frequently dispassionate, Zolberg dismisses Huntington as advancing "an unimaginative revival of ancient nativist stereotypes" little different from those of earlier isolationists such as Henry Cabot Lodge. Zolberg is the anti-Huntington of our time, and the reason is not hard to find. If there is anything exceptional about the United States, it lies in the country's artificiality—or, if less derogatory implications are warranted, its artifice. Diverse from the start, we have never defined our identity biologically. But neither have we replaced biology with a conception of culture meant to appear unchanging and beyond the control of the people who shape it. A capacity to adopt the culture we want has been especially true of our more expansive periods, when we welcomed immigrants from quite different cultures with enthusiasm. But it is even true of our most restrictive periods, when, fixed on protecting a racial balance favoring whites or a religious balance favoring Christians, we nonetheless brought people to our shores who both assimilated to the culture they found and changed the culture they found through their assimilation. There is a tendency, when discussing immigration, to define some periods as normal and to view others as conforming to or deviating from the norm. As Zolberg rightly points out, there is not now, and there never has been, a norm that provides a definitive statement of the reciprocal obligations owed by present Americans to future ones. Immigration policy is always improvised, done on the fly. For that very reason, immigration, rather than fiscal policy or statecraft, is the best subject for utilizing the tools of American political development. 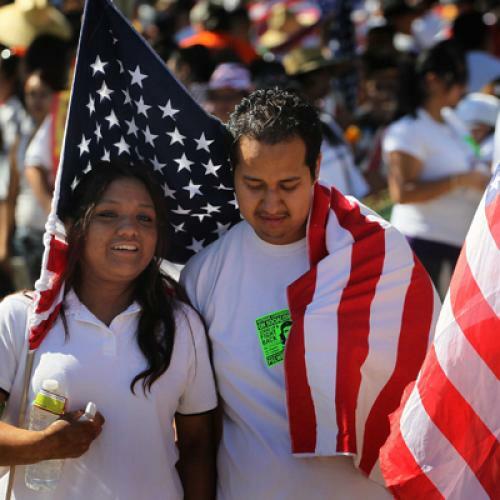 What we discuss when we talk about immigration is the political development of America. So how, then, did America develop? Because we were a land before we were a nation, and because the land we inhabited was sparsely populated, we debated immigration policy even when we were a British colony. Among the many charges that Americans leveled against George III in their Declaration of Independence, there was this: "He has endeavored to prevent the Population of these States; for that purpose obstructing the Laws for Naturalization of Foreigners; refusing to pass others to encourage their migration hither, and raising the conditions of new Appropriations of Lands." This was not a pre-ordained complaint; the American colonies could have continued to accept whomever the British sent, content to allow the shape of their political system to be determined by forces outside of their borders. But they chose to become their own country by allowing people from other countries to enter, a paradox that has defined American immigration policy ever since. Once the decision was made to acquire more people, the question of what kind of people they should be took priority. From the start, prominent voices urged that the new country should not admit everyone who wanted to come—or, in the colonial situation, everyone who was sent. "Thou art called our MOTHER COUNTRY," Benjamin Franklin wrote in 1751, "but what good Mother ever sent Thieves and Villains to accompany her Children; to corrupt some with their infectious Vices, and murder the rest?" Franklin would spend the rest of his life in opposition to capacious immigration, including not only criminals and paupers in his category of the unwanted, but Germans and other non-native English speakers. Read Franklin today, and you might conclude that nativism was as American as apple pie. But the truth is that the forces pushing for a generous conception of American citizenship were too powerful to resist. America's first great nationbuilder, Alexander Hamilton, knew full well—as, by the way, did Franklin himself—that if the United States was to develop industry rather than settle for agriculture, it would need to open itself to the importation of workers hoping to better their lives. Hamilton's concerns, like those of business lobbyists today, were practical more than theoretical. As if anticipating what economists would later call "dual labor markets," Hamilton envisioned a system in which low-wage workers from abroad would work in the newly emerging factories, leading native-born Americans of means to become embodiments of republican virtue by avoiding the degradation of industrial employment. An economic panic in 1792 stymied Hamiltonianism, as did the endorsement by Federalists of the Alien and Sedition Acts (the forerunners of today's Patriot Act). But Hamiltonianism would inspire immigration policy as it did foreign and domestic policy. Whenever industrial expansion beckoned, legions of workers would appear in American ports. Opposition to immigration also ran into practical considerations from the start. Thomas Jefferson's agrarian republicanism was in theory hostile to immigration, but when the Federalist Party turned nativist with the Alien Act, Jefferson saw an opportunity to win voters to his side; and Irish immigrants in New York may well have sealed his victory in 1800. While Hamilton, defending his party, began to argue against immigrants' receiving the vote immediately upon arrival, Jefferson started to move in the other direction. As their mutual flip-flop suggests, economic needs and opportunistic politics left little room for intellectual consistency on the immigration question. No one expressed the ambivalence toward immigration in the early years of the American republic better than Tench Coxe, an economic adviser to both Hamilton and Jefferson. In a paper read before the Society for Political Enquiries in 1787, Coxe declared that "the present situation of America renders it necessary to promote the influx of people; and it is equally clear, that we have a right to restrain that influx, whenever it is likely to prove hurtful to us." There is a tendency to view battles over immigration as fights between nativists wanting to close the borders and cosmopolitans wanting to keep them open. Some thinkers and activists fit easily into one or the other of these camps: Tom Paine was as welcoming to immigrants as Ben Franklin was hostile. But even though the United States was founded by leaders trained in philosophy and adept at public argument, Coxe's inability to land on one side or the other reflected a reality in which philosophy took second place to state-building. Immigration, in other words, did not follow from a preconceived idea of the form that the American state should take. On the contrary, the American state was formed out of clashes over economics and politics, and American immigration was held hostage to those clashes. For this reason, Zolberg's title is somewhat misleading. America is "a nation by design" in the sense that it did not spring full-blown out of nature. But its design was haphazard; no single architect drew up the plans. Debates over immigration tended to be retrospective; after the doors were opened (or closed), we then discussed the reasons. Although it was shaped more by historical circumstance than by political philosophy, immigration had consequences for how states should organize and justify their political arrangements. Worried about receiving too many foreigners lacking in republican virtue—and unwilling to endorse conceptions of a free labor market that might undermine their system of slavery at home—Americans in the early years of the republic still developed an immigration policy quite radical for its time. If workers were free to come here, employers in Europe would have less control over their workforce. If immigrants were to be welcomed from non-Protestant countries, religious tolerance could not lag far behind. In fact, Roman Catholics received the benefits of full American citizenship fifty years before British Catholics received them in the United Kingdom, and Jews were eligible for citizenship in this country before they were in France. If the number of eligible voters expanded with each election, elites would not be able to count on deference to maintain their hold on power; immigration policy and the rise of American democracy grew together. The American approach to immigration shattered assumptions about land, belonging, exit, and loyalty that had existed in Europe for centuries. As a consequence of immigration, Zolberg writes, "a distinctive society emerged, combining a rapidly emerging market economy with liberal political structures, and harboring a middle-class culture derided by European elites as uniquely vulgar." Immigration not only shaped our society; by aligning itself with expansion in economics and openness in politics, it defined it. Still, no sooner did immigrants begin to arrive in substantial numbers than second thoughts began to be uttered. When he visited the United States in 1831, Tocqueville thought he had discovered a recipe for democratic stability: he found here an "Anglo-American" population with plenty of available land, conditions ripe for what today we would call upward mobility. But Tocqueville then began to notice the presence of immigrants in the United States, and the more he pondered their significance, the more he worried. "One also encounters in their midst a multitude of Europeans whom misfortune and misconduct drive, day in, day out, toward the shores of the new world," he wrote in a footnote to Democracy in America. "These men bring to the United States our greatest vices, and lack any of the interests which might offset their influence." Tocqueville was not the only one to express reservations about immigration. Samuel F.B. Morse, inventor of the telegraph and one of this country's great nativists, first published his thoughts on the dangers of immigration three years after Tocqueville came here. Morse, Zolberg points out, was as much a Jacksonian Democrat as a xenophobe. As with the founding generation, immigration, in Morse's view, while not deriving from a philosophical view of the world, nonetheless raised deep philosophical issues. "What is at stake," Zolberg observes in a summation of Morse's arguments, "is no less than America's unique world-historical mission." Generally friendly to increased immigration, Zolberg does not dismiss the concerns of Tocqueville and Morse as frenzied irrationality. The Catholic Church in the 1820s and 1830s, he reminds his readers, was no friend of liberalism or democracy; Mirari Vos, one of the papal encyclicals denouncing liberalism, was published in 1832, the same year that Tocqueville began to write his great book. In the years between Jacksonian democracy and the outbreak of the Civil War, moreover, ideological lines quite different from those of our day predominated. The Know-Nothings may have opposed Catholic immigration, but they also denounced slavery; whereas the Democrats of that time, anxious to increase the number of immigrants who would vote for them, supported the South in its desire to maintain its peculiar institution. If you were a right-thinking liberal in the 1840s and 1850s who wanted to see urban corruption curtailed, government more involved in the regulation of economic activity, and slavery abolished, you would have voted for the party that supported greater control over America's borders. These were roughly the forces that combined to pass the Passenger Act of 1855, described by Zolberg as "the most significant victory for restriction to date at the national level." Only a slowing down in the number of arriving immigrants in the five years preceding the Civil War stopped the restrictive movement of the times. In their own way, mid-century nativists understood the huge transformation the United States was about to undergo, which is why they so furiously opposed it. Still, their campaign to limit immigration, facing the capitalist juggernaut about to burst on the scene, was doomed to fail. Hence Lincoln, who won the presidency in 1860 with the help of the nativist vote, by 1863 was calling for a new and less restrictive immigration policy, even while fighting a civil war. The Lincoln administration added a new twist to the political economy of immigration; rather than relying on laissez-faire, an economic theory at the time associated with the Democratic Party, Republicans envisioned a system in which government would work hand in glove with private firms, such as the American Emigrant Company, to bring foreign workers together with American employers. One of the most visible industries demanding cheap labor from abroad was the railroad industry; the Central Pacific Railroad, formed by Leland Stanford and Collis Huntington, was organized in 1861, and despite Stanford's fear of an "inferior race," it was not long before large numbers of Chinese found their way to the American West to lay track. As a result of industrial expansion, immigration, once derived primarily from Europe, had become global in its reach. Since Chinese workers were first used as strikebreakers, and since the emerging labor movement understood full well the capitalist desire to pay low wages, the years after the Civil War also marked the entry of labor as a major player in immigration debates, generally on the side of exclusion. "These imported men show no disposition to become citizens of this country, but, on the contrary, seek to obtain a certain sum of money ... and with it return to Italy or Hungary," complained Knights of Labor leader Terence Powderly. Martin Foran, most likely the first labor union official elected to Congress, led a campaign to forbid foreigners abroad to enter into labor contracts with American firms, a way of upholding the principle of voluntary immigration while simultaneously trying to prevent intentional efforts to hold down wages. The idea behind both complaints, Zolberg writes, was to distinguish between sojourners--those who intended to return home after making whatever money they could here—and those insistent on becoming American citizens. That distinction continues to this day, only now restrictionists insist that the problem with sojourners is not that they choose to leave but that they choose to stay. By the last decade of the nineteenth century, the transformation that worried immigration's opponents in the years before the Civil War was complete; we were now a major industrial power, and as such we were a leading importer of workers. The main question was no longer whether immigration could be stopped—so long as big business dominated politics, it could not be—but whether it could be regulated. Social scientists certainly believed that it could be. The American Economics Association, which was founded by critics of laissez-faire, some of whom were motivated by strong religious convictions, wanted to control immigration for the same reason that it wanted to control the free market; in both cases, freedom for the few meant exploitation for the many. Protestant reformers—the children of the abolitionists who wanted slavery ended—also joined the cause; Zolberg points out the similarities between those who wanted to control drinking and those who wanted to control the number of arriving foreign workers. Even immigrants themselves began to have qualms about immigration, among them the labor leader Samuel Gompers. Most important of all was a political change in the South. Once friendly to immigration on the ground that it would increase the percentage of whites in states below the Mason-Dixon line, Southerners began to listen to the frequently racist rhetoric emerging among immigration opponents in the North with a sense of "I told you so" glee. Although groups such as the American Jewish Committee remained sympathetic to immigration as the nineteenth century drew to a close, the tide was clearly beginning to turn in favor of restriction. The tide would turn into a tidal wave in the first decades of the twentieth century. A combination of fears contributed to the new mood, including fear of a cholera epidemic in the Middle East and Russia, fear of large numbers of Jews finding a new life in New York and other cities, and fear of involvement in the European political troubles that would contribute to World War I. Henry Cabot Lodge, a New England patrician, embodied the new mood. Instrumental in forming the Immigration Restriction League in 1894, Lodge helped change the language of immigration restriction from one of economics to one of race. Lodge was not successful in his efforts to enact literacy tests for new arrivals or to include data about race in the census. Yet his efforts once again underscored the strange alliances that formed around the immigration issue; patrician conservatives and labor-union radicals found themselves on the same side, with industry and its allies on the other. Lodge is best known today for his opposition to the League of Nations treaty negotiated by Woodrow Wilson in the aftermath of World War I. Isolationism and restrictionism reinforced each other; an unwillingness to work with other nations was accompanied by an unwillingness to receive people from other nations. When an economic slowdown in 1922 softened the demand for foreign labor, the stage was set for the modern Republican Party to make a place in its worldview for nativism. "We want the beaver type of man," wrote Labor Secretary James Davis in 1923. "We want to keep out the rat-type." With respect to immigration, the 1920s became the decade of quotas. In 1924, Congress passed the Johnson-Reed Act, which limited immigration from any particular country to 2 percent of the total number of immigrants from that country living in the United States in 1890. (Johnson-Reed would remain the law of the land until the 1960s.) Why did business support restriction when it formerly had opposed it? "What tipped the scales," Zolberg concludes, "was that businessmen were not merely capitalists but also social elites, swayed by concern for cultural regulation as much as by balance sheet imperatives. They sought to keep 'Bohunks,' 'Kikes,' and 'Dagoes' out of the country for the same reason they excluded them from their clubs and universities." The restrictions imposed in the 1920s closed off one possible escape from Hitler's persecutions and eventually the Holocaust. Zolberg oddly downplays the significance of anti-Semitism as a cause of these restrictions. In Zolberg's view, Breckinridge Long, the assistant secretary of state for administration under FDR—exactly the kind of man who would keep Jews out of both his country and his country club—was more motivated by security concerns than by racial and religious bigotry. Yet hostility toward refugees would continue after Germany's defeat rendered security considerations irrelevant. Even as the Cold War with the Soviet Union made efforts to restrict the relocation of Nazism's victims difficult, Congress in 1948 cut down the number of refugees allowed into the country and "mortgaged" future admissions by counting them against the quotas established by Johnson-Reed. Whatever lessons Americans learned from World War II, generosity toward foreigners was not one of them. In 1952, Congress passed (over Harry Truman's veto) the McCarran-Walter Act, which revised (and preserved) the national-origins system and made it easier for the government to expel immigrants for ideological reasons. Given these five or six decades of restrictionism, it is remarkable that the United States returned to more expansive ideas about immigration in the 1960s. In part, immigration liberalization was the revenge of the Catholics—now America's largest religious denomination—against the Protestants who once sought to exclude them; John F. Kennedy had both idealistic and practical reasons for courting immigrants, as does his brother today. In addition, the soaring rhetoric of the civil rights movement put national-origins quotas on the rhetorical defensive. But immigration reform was also possible because immigrants had become harder to find. In 1965, when Congress abolished national-origins quotas, the percentage of Americans who were foreign-born was at its lowest since the 1830s. The 1965 law had dramatic consequences, not only stimulating vast new groups of arrivals, but bringing in the bulk of them from non-European countries. Among the conspiratorially inclined, there lingers a feeling that proimmigrant forces in Congress engaged in subterfuge to open the borders when no one was paying much attention. Yet the radicalism of the 1965 law is better explained by the fact that almost no one understood how radical it would be. Now it seems obvious that if you give immigrants the right to bring over their spouses, then new spouses can bring over siblings who then can bring over their own spouses. But few had worked out the math, and even fewer appreciated the extent to which non-Europeans would take advantage of the opportunity to get into the United States. Immigration reform is a textbook example of how human behavior can have unanticipated consequences. But 1960s-style immigration reform did not in a formal sense contribute to the dramatic rise of illegal immigration that followed its passage. That illegal immigration represented a major shift in American immigration patterns, and it had more to do with economic and technological changes than legal ones. A strong American economy linked to a weak Mexican one (which in turn was linked to high Mexican birth rates) was a contributing factor, as was an increasingly competitive version of American capitalism anxious to keep down wages. Cheaper long-distance calling, more sophisticated international networks, and eventually e-mail would allow illegal immigrants here to spread the word about job possibilities to people back home. Courts were more sympathetic to the rights of illegal immigrants than were legislative bodies, no doubt inducing more illegal immigrants to take the chance to get here. In an odd way, the rise of illegal immigration became the best argument in favor of legal immigration. Nativist politicians who might once have attacked all immigrants could now offer a contrast between the hard-working good ones (who were legal) and the scurrilous, law-breaking, welfare-draining ones (who were illegal). But backlash became inevitable once Americans began to recognize how the 1965 act and the rise of illegal immigration had changed the racial and ethnic composition of their society. The big surprise, therefore, is how difficult it has turned out to be to alter dynamics set in motion during the 1960s, given the more restrictionist mood in the half-century that followed. A senator and a congressman from states with minimal immigrant populations, Alan Simpson of Wyoming and Roman Mazzoli of Kentucky, managed to defeat hard-line restrictionists in 1986 by linking employer sanctions to limited amnesty. Yet Simpson-Mazzoli never really worked. Business tends to get what it wants in our political system, and so sanctions against business were rarely enforced and new arrivals continued their inflow. It also proved difficult to limit amnesty by rationing legal status among those seeking it, given the disposition of the courts to insist on the protection of individual rights. Simpson-Mazzoli did not stop the conflicting forces battling over immigration so much as it postponed the clash between them. That clash is what we are experiencing now. Whatever action Congress takes in 2006, employer sanctions will not feature significantly in it. Just as they refuse to reconsider tax cuts, thereby forcing themselves into the corner of slashing popular programs to bring the budget under control, the House Republicans, intent on not imposing burdens on business, have forced themselves into a position of criminalizing illegal immigration in order to bring the border under control. Even if they retreat from this position in a future compromise, their toughness on immigration, despite widespread opposition to generous immigration policies among the public, is unlikely to be of much political help to them. Americans who (rightly) want the borders tightened also like to view their country (rightly) as a land of liberty. And Bush understands the politics of immigration much better than Dana Rohrabacher or Tom Tancredo: Republicans may well become a minority party if they alienate themselves from Latinos, the most rapidly growing group in the country. Why were the doors not shut? Zolberg asks. The answer seems obvious: so long as the doors are already open, and so long as some of those who come through them wind up voting, the doors are unlikely ever to be completely closed. Since he identifies so strongly with the new field of American political development in the opening part of his book, I expected Zolberg to conclude with a discussion of what we can learn about the formation of the American state from a close historical examination of immigration policy. The one theme that emerges again and again in his historical discussion is the theme of contingency. Nothing about immigration has been historically determined in the United States. Instead, alliances formed and dissolved; people who felt one way on the issue came to feel another way at another time; advocates of racial purity kept trying to close the doors that business interests had opened; and reforms designed to solve certain problems invariably opened up others. In the spirit of American political development, especially its love of "path dependency," Zolberg's lesson is this: even if the past is not determined, it still limits what we can do in the present. Understanding the contingency of America's long history of immigration policy ought to lead us to avoid believing that order can be brought to chaos through any particular law or administrative action. Yet when Zolberg comes to the end of his narrative, he surprisingly turns normative. Rather than explaining the past, he addresses the question of what America should do in the future. And he does so not by sticking close to the historical narrative he presents throughout the book, but by turning to age-old moral questions involving social justice. One obvious reason for this change of intellectual direction is autobiographical. Zolberg has the rare distinction of having once been a stateless person. The child of Polish Jews, he grew up in Belgium, which, unlike the United States and its tradition of jus soli, adhered to the European idea of jus sanguinis, making blood rather than soil the defining characteristic of citizenship. Zolberg arrived in the United States in 1948, at the age of seventeen. Like Hannah Arendt and other refugee scholars, whose own stateless condition informed their scholarship, Zolberg has personal as well as academic reasons for exploring the dynamics of immigration policy. A Nation by Design may well prove to be the last significant book written by a Jewish World War II refugee trying to explain America to the people who welcomed him. There is one other overlap between Arendt and Zolberg. As he drifts away from American political development, Zolberg drifts toward the kind of philosophical questions addressed by Arendt—and more significantly, by her fellow native of Konigsberg Immanuel Kant. How far do our obligations as human beings extend? No good liberal could ever conclude that they extend only to those with whom we share citizenship at any one point in time. Were we to opt for nationalism over cosmopolitanism, Zolberg argues, we "would require no less than the transformation of the United States and other affluent democracies into police states, protected by a new iron curtain or a Berlin wall." Political scientists rarely make good prophets, but this seems prophetic enough; Zolberg wrote his book before House Republicans decided to include in their bill a wall between Mexico and the United States. If it is true that once we chose to become a liberal democracy, a generous policy toward immigration followed, then to remain a liberal democracy, we will have to resist urges to privilege those already here over those who want to come here. Yet Zolberg correctly points out that while there is a near-universal consensus in favor of the right of exit, there is no consensus at all on the right of entry. Consistency would suggest that once countries cannot prevent people from leaving, others should not prevent them from entering. But this is a false consistency. Following the philosopher Brian Barry, Zolberg points out that if nations admitted everyone who wanted to join them, there would soon be nothing valuable left to join. Cosmopolitanism must be tempered by realism. In this complicated world of difficult choices, the burden of proof, Zolberg concludes, should always be on those who want to close the borders. And for those who would keep them open, "priority must be given to those in greatest need, people who cannot survive in their country of origin because they are the target of persecution, because of life-threatening violence, or because there is no possible way of making a living." There is no one algorithm that we can apply to determine how many newcomers we can welcome. To live with immigration is to live with imperfection. For the same reasons that liberals call for regulating the market generally, they must call for regulating the market in human labor more specifically. It is not humanitarian to allow business to search for the most exploitable workers it can find—soon Mexico will be far too expensive for them compared to, say, Thailand—and allow them to come here to work. Nor is it liberalism to watch the resulting market dynamics drive down wages for others, including those who have legal status in the United States. There is something ugly about criminalizing illegal aliens, rounding them up, and deporting them. But there is nothing ugly about demanding that private companies take more responsibility for the quality of life of the workers they employ. Zolberg has been working on this book for three decades. One wants to say that his timing is nonetheless fortuitous, since his book appears right in the middle of one of the more contentious debates in American history over the immigration question. But then again, reading this book reminds us readers that in American history there have always been contentious debates over immigration policy; immigration is the issue that has never gone away and will never go away. A historian listening to Dana Rohrabacher or Ted Kennedy is likely to conclude that not much is new. That would be true, except for one thing: we now have in our hands a book so thoughtful, so extensively researched, and so balanced in its conclusions that if it does not inform both the current debate and the ones sure to follow, the debate is bound to be poorer even than it already is. Alan Wolfe is currently writing a book about political evil.